Consider fixing your cat before she is sexually mature. Kittens are tiny, fluffy and innocent creatures that grow up before you know it. In what seems like the blink of an eye, your little darling can transform from a helpless newborn into a grown adult, capable of reproducing. Learn to pinpoint the signs of a sexually mature feline. Female cats -- also known as queen cats -- usually go into puberty at around 6 months, although it varies case by case. For early bloomers, it can be as young as 4 months. For late ones, it can take up to one year. When queens reach reproductive maturity, they begin their heat cycles. During heat, they are ready and prepared to mate, and are usually very vocal about. Some telltale indications of heat include persistent and loud yowling, unusually affectionate and tactile behavior, restlessness and frequent attempts to escape. 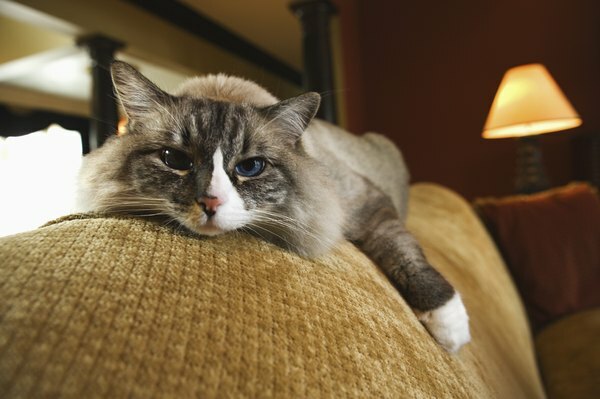 If your cat is in heat, chances are you -- and the rest of the neighborhood -- will know it. Male cats are known as tomcats, and they tend to become sexually mature at the same approximate time frame as queens -- about 5 or 6 months in age. Though males don't experience heat cycles, they too are extremely vocal regarding their mating urges. Some typical signs that a male cat is sexually mature include constant yowling and meowing, territorial urine spraying, constant attempts to run away and wandering. Perhaps the most obvious and unpleasant sign is the urine marking -- the tomcat's way of luring in nearby receptive females. Spaying and neutering of very young kittens is becoming increasingly common practice for many clinics and hospitals. The ASPCA states that it is routine for veterinarians to spay cats as young as 6 to 8 weeks old. At this point, cats haven't even come close to reaching sexual maturity yet. The early surgical procedure not only prevents cats from reproducing in the future, but it also cuts out the aforementioned stressful behavioral patterns. Lastly, it stops female cats from experiencing the physical discomfort associated with carrying a litter of kittens. Although both male and female cats are physically capable of reproducing at merely months old, most breeding practices wait significantly longer before allowing them to do so. Generally, cats are about 18 months in age when they start the process. If you have no interest in breeding your pets, get them fixed as kittens and help prevent cat overpopulation. Your fluffy pals will be grateful to you for it. Santa Barbara Humane Society: Why Spay and Neuter? How Old Does a Male Cat Have to Be to Produce Kittens? Can Kittens That Are 4 Months Old Get Pregnant? What Can You Expect When a Kitten Hits Puberty? Do Male Kittens Go Through Puberty? When Does a Golden Retriever Have Its Mature Coat? When Does a Cat Reach Sexual Maturity? "Age, Maturity & Growth in Cats"
How Old Are Male Kittens When Their Testicles Drop?